Back in February, Subway pledged to stop using Azodicarbonamide, a controversial chemical that it uses to improve elasticity in its bread but that also shows up in things like yoga mats. You won’t be doing any downward dogging (that’s how yoga people talk, right?) on Subway’s bread soon, as the company says it’s almost done phasing out the chemical. The ingredient is approved for use in food by the Food and Drug Administration, but its use in products from everything to the aforementioned mats to dough prompted a food blogger to launch a campaign against it recently. Subway’s chief marketing officer, Tony Pace, tells the Associated Press that the phaseout should be complete within a week. 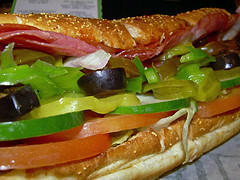 At the time of the blogger’s petition in February, Subway said it’d already started to test “Azo-free bread” in four markets and was in the process of removing it from all breads. “We’re always trying to improve stuff,” Pace said. Look at that — companies, they’re just like us! I’m always trying to improve my stuff, because having the best stuff possible is ideal.